Is this all just a big Communist conspiracy? 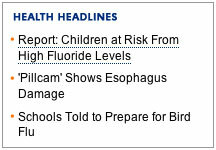 Good lord, maybe Gen. Jack D. Ripper was right about fluoride and our precious bodily fluids! Link via ABC News.